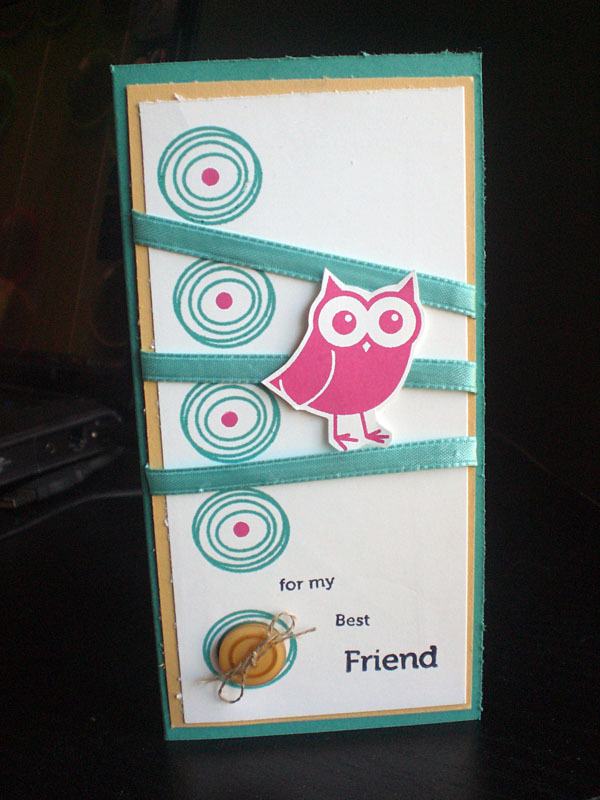 Well after a short break from stamping I was finally able to create a card for Dawn’s Second Color Cue Challenge. I just moved to the opposite side of town and have been trying to get my new house in order – so needless to say stamping was not a priority! But I missed it so much and was so happy to spend some time this weekend catching up! Here is my card using the “Funky Flowers” stamp set from W Plus 9 Design! I had a blast with this color combo and played with a new card size. I wanted something vertical and versatile. I think this card could be used for just about any occasion! Love it! Hello, darling girl! Congratulations on your move! I hope you are getting settled, nicely! From the look of this card, your creative mojo has clearly been unpacked! Hee Hee Wonderful stamping and color magic with the great card! Welcome back to Blogand ~ You have been missed!